We have the capabilities to provide care to your pet should they need to be hospitalized. We have full diagnostic capabilities including bloodwork, microscopy and x-rays. We also have the facilities to provide careful monitoring, intravenous fluid therapy, catheterization and care for conditions that do not require 24 hour critical monitoring. We routinely treat patients with serous conditions that need to stay for a day…or a few days…until they are healthy enough to return home. 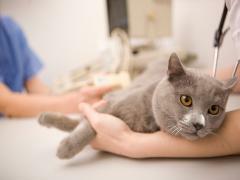 In some sittuations, a dog or cat may require 24 hour monitoring and treatment (critical care). If this is the case, we can transfer your pet’s overnight care to one of the local 24 hour referral hospitals.